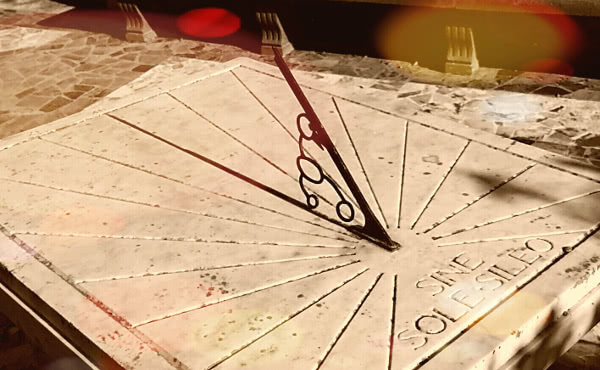 Among the classical inscriptions found on sundials, one has a charming simplicity, although it seems to state the obvious: Sine sole sileo. “Without the sun, I remain silent.” Such self-evident expressions often pass unnoticed, and yet they may contain important truths for our lives. Just as without sunshine a sundial becomes only a decorative piece, or a plant deprived of daylight can end up withering away and dying, so too the ideals God has placed in our heart can fade away and even vanish if we lack the “sunshine” of rest. Generally speaking, there are two types of tiredness, one physical and the other psychological. These are closely related, because each human being is a unity of body, mind and spirit. One type of tiredness usually influences the other and tends to aggravate it, giving rise to little, or not so little, spirals of fatigue. Someone who gets physically exhausted can find their mind and heart becoming numb and unresponsive. And a person who gets psychologically tired can end up expressing it physically, in bodily aches and pains that accentuate the inner tiredness. This second downward spiral is especially subtle, and it is good to pay attention to it. For it could easily be overlooked by the person suffering from it and by those living with them. Without getting alarmed, we need to be on the watch for this, since prevention is the best cure. At times difficulties can crop up in people’s lives that are due, not to a lack of dedication or interest, but fundamentally to tiredness. One type of tiredness usually influences the other and tends to aggravate it, giving rise to little, or not so little, spirals of fatigue. Certain circumstances in life can be particularly draining, especially when they have to be made compatible with the normal course of life. For example, the illness of a family member, the birth of a new child, an especially demanding period of study or work, or the piling up of all a whole stack of problems… Such situations, above all when prolonged, require making provision for times and ways of resting, even if fairly brief, to prevent the wear and tear from leaving a permanent mark or even becoming chronic fatigue. The support by people who live alongside someone in this situation is decisive. But equally crucial is promptness in requesting assistance, since others might be unaware of just how exhausting something is becoming for that person. The support by people who live alongside someone in this situation is decisive. Just as “a stitch in time saves nine,” and can prevent a small tear from spreading, so too the first and best way of resting is to learn not to get excessively tired, not to get exhausted. At such times we may need to step back for a while and let others battle on the front line, even if we find this hard to accept. This doesn’t mean shirking responsibility or becoming unyielding. It simply means recognising our own limitations and also at times being detached from the outcome of our efforts. God wants us to spend ourselves for love, but not to become so spent that our love is extinguished and the building collapses, like the house built on sand (cf. Mt 7:24-27). “Physical collapse. You are worn out… Stop that exterior activity. Rest. Consult a doctor. Obey, and don’t worry. You’ll soon return to your normal life and, if you’re faithful, you’ll improve your apostolate." And so when taking on tasks, it is important to distinguish between availability – an attitude of service, being open to whatever might be asked of us – and an excessive sense of responsibility, whereby we try to take on more than we are really capable of. In this, as in everything, it is wise to try to strike a balance. It is not a question of being impervious to unexpected demands, which are frequent in everyday life; but neither is it a matter of letting our whole life become one unexpected task after another, to the extent that we can avoid it. Some quite alert and capable people find it hard to decline requests. Sometimes they prefer to take on a task even though they know they don’t have the time or energy for it, rather than disappoint someone or look bad. And sometimes they might take it on because they know they can resolve the matter better than others, not out of presumption but based on experience. There are also people who are very sensitive to others' problems, and who may tend to take on too many of them. While other people, who are very attentive to details, may find it hard to finish their tasks, and their work piles up and overwhelms them. All these people gauge their own capabilities poorly, and can end up like an overloaded cart. Strong horses are of little use if the axles are bent by the weight they are carrying. Even if at first the axles turn, they end up getting bent or even breaking. Among people who take their work seriously, one or another of these features can often be found. And sometimes a perverse effect can occur that only serves to aggravate one’s tiredness. Since such people rarely decline a request and truly try to work well, others tend to ask them for more favours. Some may try to take advantage of their good will; while others may not realize (and sometimes have no way of realizing) the burden the other person is bearing. When fatigue begins to set in, that person might explode, or respond angrily, irritated at the rest of the world, much to the surprise of others. Since each person placing demands only knew about the favour they asked for, while the person in question bore the brunt of them all, this reaction can seem incomprehensible. And so someone with a sincere disposition to be helpful might in fact become somewhat bitter and isolated. Here too the wisdom of Sirach holds: There is a man who works, and toils, and presses on, but is so much the more in want (Sir 11:11). In weighing work we need to distinguish between generosity and “prodigality.” With the latter, a person gives more than he or she should, thus becoming incapacitated to go on giving. The present shouldn’t make us lose sight of the future, even the near future. We need to learn to read the tell-tale signs of tiredness, both in ourselves and in others. Not everyone gets tired for the same reasons, nor at the same rate. But the symptoms are similar: the defences supporting the personality are lowered and character limitations come to the fore. Someone who is tired is inclined to see things more pessimistically than usual, which can lead to a person of an optimistic bent reacting with an apathy that seems strange. Another person with a tendency to worry will find many reasons for becoming uneasy and can end up paralysed, and needs to be helped to realize that he or she is not seeing things objectively. Someone who is normally mild-mannered may react with a brusqueness that in another person might simply be a habitual character trait. Someone who is tired is inclined to see things more pessimistically than usual. A refined expression of friendship is to help others by putting oneself at their side and teaching them with real empathy to be able to say no to certain requests without feeling remorseful. Or to leave aside projects that might occur to them, if it is unrealistic to take them on. Or to see things in perspective, and perhaps leave some things less perfectly finished than they would prefer. We need to help them see, beyond what they have in hand at the moment, or new ventures that might occur to them, their duty to rest. In recent decades ever more frequent cases of “burnout” or stress at work seem to be occurring, especially in the service professions: doctors, nurses, teachers priests... These are people passionate about their work, because there is nothing so appealing as dedicating oneself to serving other people; but they find themselves overwhelmed by the constant demands they receive from without and from within. It’s like what happens to an electrical cable that receives so many signals from its multiple connections that it ends up burnt. Three possible signs of “burnout” are a feeling of emptiness, exhaustion, and being overburdened. In order to prevent these situations and provide timely assistance, attention needs to be paid to the person’s way of being. Features of one’s personality that can lead to “burnout” are an exaggerated sense of responsibility, perfectionism, insecurity, or being overly demanding on oneself. In short, having unrealistic expectations. We also need to pay attention to the work atmosphere in the place where a person works: how tasks are allocated; how one rests; what the incentives and rewards are; the ongoing formation of personnel. Neglecting these environmental factors, or the tendency to give excessive responsibility to younger staff without dedicating time to their proper training, or without giving positive reinforcement, is a risk factor. Although it goes without saying that people are very different, today’s fast pace of life can sometimes lead to dedicating little time or effort to evaluating what we can expect from each person. Some people, for example, are quite capable of resolving unforeseen matters that can often arise in the workplace. We could even say that they enjoy doing so. As in sports for people who enjoy risks, unexpected challenges shake them out of their routine and can even prove restful. Other people need more stability. What others find restful, they find exhausting. Therefore it is important that managers in companies are careful to avoid that someone, probably quite capable, is given a task that wears excessively on them. Most people have some degree of flexibility, and can overcome their limitations with experience and advice. But with others, it’s better to seek someone else for that task. All jobs have their unpleasant side and sometimes there is no alternative but to adapt to the situation. But when someone is in the right place, that person yields more and rests more. But when someone is in the right place, that person yields more and rests more. At times being overloaded with work might not be due to the self-induced fatigue that comes from taking on too many tasks or handling them badly, but rather to organizational deficiencies within the company. For example, someone might have more work than is reasonable, because too many people can give them things to do. Although it is important that those in this situation speak to their bosses in order to adjust their workload, it is also an important part of the managers’ responsibility to be aware of such situations. It is necessary to look after people so that they don’t break down, and show a concern not only for efficiency, but also for the well-being of each employee and their families. Sometimes, however, the situation is not easy to remedy, because the person and the enterprise are the same thing, or because the person bears the burden of leading a project that can become almost tyrannical, which can make it hard to recover one’s strength. “But what if my Cross should consist in boredom or sadness? In that case I say to you, Lord, with You I would gladly be sad.” Even when we become exhausted because we didn’t know how to rest in time, or because of our own limitations, we need to rediscover and savour the deep happiness promised by our Lord’s words to the weary, who today may be some of us and tomorrow others – because who does not get tired sometimes along the path of life? Come to me, all who labour and are heavy laden, and I will give you rest. Take my yoke upon you, and learn from me; for I am gentle and lowly in heart, and you will find rest for your souls. For my yoke is easy, and my burden light (Mt 11:28-30). Saint Josemaria asked that this inscription be engraved on a sundial in the garden of Villa delle Rose, a conference center in Castelgandolfo, Rome. Saint Josemarίa, Letter 15 October 1948, no. 14 (quoted in Andres Vazquez de Prada, The Founder of Opus Dei, vol. 3, Scepter, New York, 2005, p. 294, note 118). Saint Josemaria, Friends of God, no. 137. Cf. F. Sarraís, Aprendiendo a vivir: el descanso, Pamplona, Eunsa, 2011. Saint Josemaria, The Forge, no. 290. Saint Josemaria, The Way, no. 706. Saint Josemaria, Letter 15 October 1948, no. 10. Saint Josemaria, The Way, no. 723. Pope Francis, Evengelii gaudium (24 October 2013), no. 82. Cf. 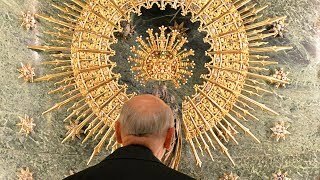 Pope Benedict XVI, Encyclical Spe salvi (30 November 2007), nos. 30-31. This hymn is prayed in the Liturgy of the Hours during Holy Week. Saint Josemaria, notes taken in a family gathering, 15 April 1974. Saint Josemaria, The Forge, no. 252.